Students at all grade levels can learn about climate, atmosphere, and oceans as they watch colors swirl during experiments they conduct, thanks to a project developed by UCLA scientists. Using simple materials such as Legos and a Lazy Susan turntable, teachers from elementary schools through colleges can set up the experiments for about $50. A website and YouTube channel provide assembly directions, lesson plans, and instructional videos. Armed with these assets, students and teachers may experiment with Earth science concepts through what the scientists call DIYnamics (Do It Yourself dynamics), in which a rotating tank and food coloring help to demonstrate the physics of fluid motion. Students discover that “science can be creative, fascinating, intuitive, and fun — and that scientific models, including rotating tanks, make abstract concepts more understandable,” said Juan Lora, who co-leads the project as a UCLA National Science Foundation postdoctoral fellow and who will assume the role of assistant professor of geology and geophysics at Yale University next year. The team’s project took off when a UCLA undergraduate, Norris Khoo, saw that Aurnou, Hill, and Lora were working to create an affordable, simple laboratory model for fluid dynamics demonstrations, and thought he could design a less expensive prototype. Khoo, who earned a bachelor of science degree in geology and paleobiology earlier this year, had played with Lego toys since kindergarten and wanted to use the plastic blocks to build a model. Aurnou was skeptical at first and asked, “Does Lego make motors? Can you turn them into a rotating table?” Khoo knew Lego sells robotics kits with motors, and he went to work creating the prototype. He used a Lazy Susan turntable as well as a motor, battery, and wheel by Lego. The team is now working on using the device to demonstrate the Great Pacific Garbage Patch — the largest accumulation of swirling ocean plastic in the world. The patch is located between Hawaii and California, and is larger than Texas, Aurnou said. DIYnamics can demonstrate the winds acting on the ocean surface that create the swirling garbage patch. Hill, Lora, and Faulk led demonstrations last year in classrooms at La Tijera Middle School in Inglewood and Ralph J. Bunche Middle School in Compton. 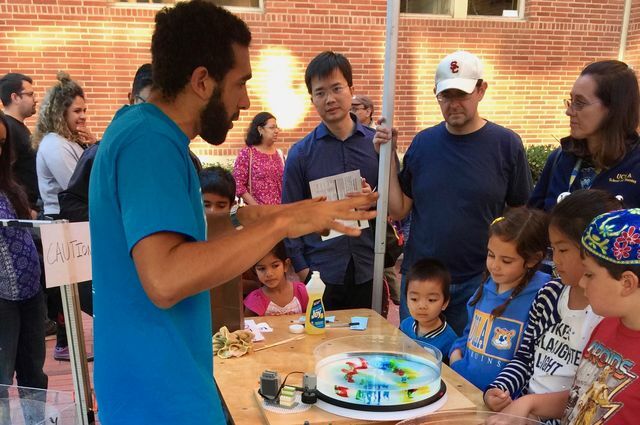 The scientists also used a larger, more expensive version of the device at UCLA’s annual Exploring Your Universe science festival this year.